There’s nothing spectacular here, but for a movie about two strangers meeting and then spending an entire night together, this one manages to be pretty entertaining. A unique film, this movie tells the story of two strangers who meet on the train, decide to go to the dining car together for a bite, and really hit it off. After chatting for a while, they agree to get off the train together and Vienna and spend the night together. I like the way none of these proposals and ideas are easy or are treated lightly. They all take some convincing. And once the couple is in Vienna, the sparks start to fly. Nothing feels forced and this movie really takes its time developing their relationship. By the second half, things do start to feel a little tiring, but that’s only because the whole movie consists of walking around together and talking. Knowing that this might be the case, the second half saves some nice additions to the plot to help the film move into different directions. This movie manages to be entertaining and interesting the whole way through. 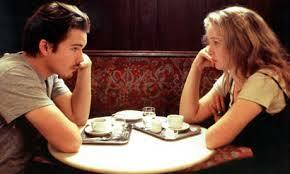 Before Sunrise is one of the early films from director Richard Linklater. This is a guy who prides himself on making experimental films that are daring and original. Usually that involves the structure of the movies more than the plot, but occasionally it’s both. Linklater started off by making Slacker, which was a sort of documentary about teenagers being interviews about their lives. He also made Waking Life, a sort of short story collection about animated dreams. And just last year, Linlater made Boyhood, a movie that chronicled the life of a boy growing up, filming every couple of years with the same group of actors, to show their growth and progression through time. So, it’s no wonder that Linlater would make a movie like Before Sunrise, which is sent entirely in one night and deals with two strangers meeting and then deciding to spend the night together from dusk until dawn. The movie is good and smart, in the ways that pretty much all of Linlater’s films are, but it also should be noted that the movies this director makes which are less experimental, and more story-driven, tend to be his better films. Movies like Dazed and Confused and School of Rock, are the ones that really end up being unique and memorable in terms of storytelling. Still, Before Sunrise is probably Linklater’s best experimental film, (It is certainly better than Slacker or Waking Life.) It’s a movie that sets out with high ambitions and a hell of a challenge, and it pretty much accomplishes its goal of being entertaining, no matter how little they have to work with. The movie opens on a train where a couple is having an argument in German. We see Celine (Julie Delpy), a French woman, sitting beside the couple, trying to ignore them. We also see Jesse (Ethan Hawke) sitting in the seats behind them, trying to stifle a laugh. Whe the couple gets up to continue their argument while walking through the train, Celine bolts out of her seat. She can’t take any more of this, and moves to the next row, beside Jesse. He then asks her what the couple was fighting about and the conversation between them begins. After talking for a few moments, Jesse asks Celine if she wants to go to the dining car with him. She agrees, and the two of them go there and sit down at a table. We see the waiter bring them menus, but we never see them order or eat anything. This is an ongoing situation throughout the film. At different times we see them sit at restaurants, but never order or eat. This is obviously intentional. The movie wants to focus entirely on their conversations and relationship and doesn’t want anything else to get in the way. In the dining car, Jesse and Celine talk about what their parents wanted from them growing up, and how their parents saw the future of their children. With Celine, it was a matter of every time she told her father what she wanted to be, he had a way of changing it into a version of that job which was more comercial and less arts-based. So, for example, when she told him she wanted to be a writer, he came back with “journalist.” Jesse’s stories about his parents and life growing up are similar. He was always rebellious and whenever someone gave him advice, he tried to do the opposite. He also tells a story about seeing his dead grandmother in a rainbow after she had passed away, and how as long as he was holding the hose to spray the water and make the rainbow, she was there, but as soon as he let it go, she was gone. He tells of how his parents didn’t believe him about this. After talking for a while, and developing a connection, the train arrives in Vienna, Austria, which is Jessie’s stop. The next morning he is taking a flight from the airport in this city, and heading back home to the United States. Jessie walks away from Celine, but then turns back and sits down with her to make a proposal. His idea is that she get off the train with him and spend the rest of the day and night together. It takes a little convincing, but he uses a time travel analogy about how years from now, when she is at home with a husband, wondering what would have happened and wishing she could find out, if she gets off now, then she will know the answer. She will be able to look upon this moment differently, when she looks back on it from the futute. This is enough to make Celine laugh, and so she gets off the train with him. Once they get off and start walking around Vienna, the movie makes it intentionally awkward and uncomfortable between them. They are no longer sitting at a table chatting, but now at a loss for words, with no plan and no idea of what to do. I love how realistic this is, as the two of them go over a bridge and all Jesse can say is, “this is a nice bridge,” before the two of them have to admit how awkaward the whole thing is. They find two guys and ask them for ideas of what to do and the guys rant and rave about a play they are in where one of them is playing a cow. Jessie and Celine say that they will try and come by to see the show. They then head to a record store where the two of them go into a listening booth to stand around and listen to some music that Celine was interested in. It’s a scene that takes place without any dialogue at all, as the two of them take turns looking at the other, while the other one is not looking. Jessie will stare at Celine, for example, as she dazes off in the distance, but as soon as she turns to look back at him, he instantly looks away. This scene seems like it will lead to their first kiss, as they are confined to such a small and isolated place. Only it doesn’t. That moment is reserved for our next scene in the car of a ferris wheel, and even that is handled nicely with Jessie wanting to kiss her and Celine having to ask him if that’s what he is thinking. As we head into the second half of the movie, the story starts to get a little tired. We’ve heard all of the conversations and seen them go from strangers to kissing. What’s next? The movie has a few tricks up its sleeve. For one thing, it brings in some other people, who each appear for only one scene as street performers looking for money. There is a gypsy who reads hands and then a man lying on the ground by the water who writes them a poem. Each of these people is interesting, but the most compelling part of it all is Jessie’s reaction to them after they have gone. Jessie is very skeptical, and thinks that both performers were completely phoney. With the poem writer, for example, he believes the man had the poem memorized ahead of time, slipped a word in that they mentioned, and did not actually write that poem just for them. Another trick the movie has up its sleeve is telling us about these characters and relationships and what their current status is. There are no twists or turns here, and that’s a welcome addition compared to movies made today where you can’t even approach the ending without sensing a multitiude of twists coming on. Instead, they simply each have a story about who they are and where their lives are in terms of relationships. At one point they play a game at a restaurant where they make imaginary phonecalls to their friends, telling their friends all about the other one. This scene, like many others in the film, turns out to be a lot of fun. The movie definitely feels like it doesn’t have all that much to it, but that’s kind of the point. This is a film that keeps things simple and tells a very straight forward, sweet, and romantic story. As someone who hates the way all romantic comedies today seem to follow the exact same formula, I applaud movies that fall into that genre and completely disregard the formula. That means we don’t need the couples to fight and break up only to come back together again in the end. When there’s a movie that does break the formula (such as In A World,) it is a rare and special exception. 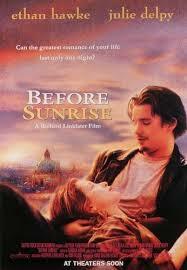 Before Sunrise is another one of these special movies. It is smart and fascinating, and I was pleasantly surprised.